Studied ballet at the National School of Ballet, Iceland and at the Ballet Rambert, London. Graduated from Royal Academy of Dramatic Art (RADA), London. Was awarded the Gerald Lawrence Shakespeare Scholarship at RADA. She played various parts in television drama productions on BBC and ITV in England. On stage in England, she participated in Charles Marowitz's Workshop and played two roles in a touring production of Under Milk Wood by Dylan Thomas, directed by James Roose-Evans. In Iceland, she played various parts on TV and with Gríma Theatre Company. 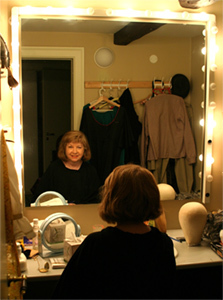 She taught actor's technique for many years at the National Theatre School of Drama and at the Reykjavík City Theatre School of Drama. Sponsored by the Ministry of Education, she lectured on dramatic art at various high schools. In children's theatre, she wrote and directed The Miracle at the National Theatre, and directed The Lost Prince on TV and on stage. Parts at the National Theatre included Anitra in Peer Gynt, Desdemona in Othello (directed by John Fernald), the Play Queen in Hamlet, Colette in The Hostage, and a patient in Marat/Sade. For the State Radio Broadcasting Station, she directed and played in drama productions, and read the novels Nana by Emil Zola, Carola by Joan Grant, and the East- and West-wind by Pearl Buck. Kristín formed her own theatre company with her husband Halldór Snorrason in 1965, Ferðaleikhúsið/The Summer Theatre. In addition to producing the following plays, her leading roles included Doreen and Belinda in The Private Ear and The Public Eye by Peter Shaffer, and the leading role in Oddities by Oddur Björnsson at the Traverse Theatre, Edinburgh Fringe Festival, Scotland. She wrote and directed a play for children called The Storyland for the Unicorn Theatre for Children, at the Arts Theatre, West End, London. She directed and designed costumes for her production of the musical Joseph and the Amazing Technicolor Dreamcoat by Andrew Lloyd Webber and Tim Rice. Every year since 1970, she has been the director and leading actress of Light Nights, in Iceland, USA, and England. Light Nights has toured the US four times (including New York City, Chicago, Boston, Minneapolis, and Madison), sponsored by the American-Scandinavian Foundation, Cultural Awareness, the Icelandic Ministries of Culture and Foreign Affairs, Vinland Revisited, and The Sons of Norway. More recently, Kristín directed her own play, the Apes' Society, at the Edinburgh Fringe Festival, Scotland, and presented Light Nights at Diorama Arts Centre in London. She wrote the play On The Way To Heaven and played the leading role in her production.